At Hasbro, we strive to provide our customers with the best possible experience with our portfolio brands. As a valued customer, we wanted to let you know that our brand websites have changed and will no longer sell products directly. That said, you can still access your account and check existing orders using your login at Hasbro Toy Shop. Please contact us at [email protected] or 1-800-408-0052 with any questions. The brand websites may just be those that have the videos, games, and shops for each brand (see below for some). Improving the toy shopping experience is always one of our top priorities. We wanted to make you aware that we’ll be making changes to the current Hasbro Toy Shop site, starting on January 18, 2019. That said, now is a perfect time for you, or the person you gifted it to, to redeem your unused Hasbro Toy Shop gift cards toward the current selection. View offerings from your favorite brands at You are not allowed to view links. Register or Login to redeem your gift card(s) or contact us at [email protected] with any questions or concerns. Check back regularly for more details. What happens to the remaining balance if I don't use my gift card before January 18, 2019??? The remaining balance on your Hasbro Toy Shop gift card can be used for purchases on the new site, launching in February 2019. What changes are you planning on making to Hasbro Toy Shop? Improving the toy shopping experience is always one of our top priorities. While we can't go into specifics, we are excited to share the new changes with you in the coming months. I want a refund for my gift card. Gift cards cannot be redeemed for cash or returned for a cash refund except where required by law. Can I have my return issued back as a cash refund and not back on my gift card? At Hasbro, we strive to provide our customers with the best possible experience with our portfolio brands. As a valued customer, we wanted to let you know that our brand websites (i.e. Transformers.com, Nerf.com, etc.) are changing and will no longer sell products directly. That said, you can still purchase items, access your account and check existing orders using your login at Hasbro Toy Shop. Please contact us at [email protected] or 1-800-408-0052 with any questions.. Unfortunately, we are not able to accept gift cards as a form of payment on Hasbro Toy Shop at this time. We apologize for any inconvenience and are working to fix this. Please contact us at [email protected] with any questions or concerns. Please use this thread to discuss all things related to Hasbro Exclusives for Comic-Con 2019. In 2019, we want to make sure the shopping experience on our direct to consumer platform is the best it can be. Starting January 18, 2019, Hasbro Toy Shop will be going “under construction” while we make changes to the site and prepare to relaunch next month. We have some exciting developments in the works and can’t wait to share more with you in the coming weeks. Check back regularly for details! What is happening to Hasbro Toy Shop? Improving the toy shopping experience is always one of our top priorities. While we can’t go into specifics, we are excited to share more about the changes to the new, more curated site in the coming months. Check back for more details! Can I still place an order on Hasbro Toy Shop? Yes, you can still place orders on Hasbro Toy Shop through January 17, 2019, 11:59pm ET. No new purchases can be made on Hasbro Toy Shop after this time. We’ll be making changes beginning January 18, 2019. How do I check on the status of a recent order? You can still access your account and check existing orders using your login at HasbroToyShop.com through February 2019. Will you be relaunching an e-commerce site? Yes; we are excited to launch our new e-commerce site in February 2019. I have a remaining balance on my Hasbro Toy Shop gift card. Can I still use this on the new site? Yes; the remaining balance on your Hasbro Toy Shop gift card can be used as a form of payment on the new site. To redeem your Hasbro Toy Shop gift card, contact us at 1-800-408-0052 and our team can assist you with your order. Please have your gift card available when you call. What brands/products will the new site include? We are excited to share more details in February 2019 about the curated selections of brands & products that will be featured on the new site. What will happen to my account information once Hasbro Toy Shop shuts down? All personal information associated with your Hasbro Toy Shop account will be deleted when the new site relaunches. Order information will be retained for audit purposes only. .
Have another question not listed here? Please contact us at [email protected] or 1-800-408-0052. Want free standard continental U.S. shipping for the balance of 2019? Join Hasbro Pulse Premium. Just make a purchase between now and 2/23/19. * And free shipping isn't all, we have some other perks planned just for our best customers. Free standard continental U.S. shipping for the rest of 2019. Monthly Premium-only discounts & flash sales. Other perks throughout the year at select fan conventions & more. Hasbro’s new site also offers a $50 membership program, which includes free shipping for a year and access to flash sales and perks at conventions. “We are still working out the details about what people get for the $50,” Stroud said. Why do I suspect that we may get a light version of Hasbro Pulse Premium by signing up this week and may wind up opting to pay $50 for a full perks version? (I will pay $50 for extra perks, hopefully for reward points.) I think we can see that exclusives will be exempt from free shipping. Want free standard continental U.S. shipping for the balance of 2019? Join Hasbro Pulse Premium. Just make a purchase between now and 2/25/19. * And free shipping isn't all, we have some other perks planned just for our best customers. Hasbro Pulse Premium does not have an auto-renew policy. I tried a test purchase and it does indeed say "Free Standard Shipping for Hasbro Pulse Premium!" and shows free standard shipping as $0.00. Hasbro Pulse Premium is the status upgrade to Hasbro Pulse accounts that gives customers free standard shipping (continental U.S. only) throughout 2019 & other perks throughout the year. Customers who made a purchase on the HasbroPulse.com site between 2/15/19 -2/25/19 receive complimentary Hasbro Pulse Premium status with any purchase. Starting 2/26/19, Hasbro Pulse Premium is available to customers for a $50 enrollment fee (+ tax). Upon enrollment in Hasbro Pulse Premium, customers will receive a confirmation email with details confirming his/her Hasbro Pulse Premium status. If a customer has not received a confirmation email, contact us and we can investigate. Customers must have their order number ready so we can verify their purchase. Account status goes into effect at the time of purchase. Customers will not have access to previously offered perks prior to their enrollment; customers will only have access to future perks offered through Hasbro Pulse Premium. Customers will be contacted via email about additional perks and incentives available with Hasbro Pulse Premium. Customers must opt-in to marketing emails to receive these updates. If a customer opted-out of marketing emails, a customer must input their email address in the email signup section at the bottom of HasbroPulse.com to re-subscribe. The customer should then receive an email confirming that they’ve been added back to marketing emails. If a customer wishes to unenroll at any time, please contact us and we will remove the Hasbro Pulse Premium status from their account. If a customer decides to unenroll from Hasbro Pulse Premium, they will only be refunded the $50 enrollment fee if they have not made any purchases with their account. Once a purchase has been made and free standard shipping has been used as a result of Hasbro Pulse Premium status, the account becomes ineligible for a refund on the enrollment fee. Free standard shipping with Hasbro Pulse Premium status is eligible for shipping in the continental U.S. only. Free standard shipping does not apply to HasLab campaigns. Free standard shipping and other perks are not valid on previous orders. Changing or combining orders, or changing your shipping address, speed or preferences might affect your Hasbro Pulse Premium status eligibility. We may exclude products with special shipping characteristics at our discretion. Starting 2/26/19, Hasbro Pulse Premium will be available to customers for a $50 enrollment fee (+ tax). Hasbro Pulse Premium does not have an auto-renew policy. Users will have to re-enroll in 2020 to be part of the program - more details will be shared later in the year about re-enrollment. If a customer wishes to be removed from Hasbro Pulse Premium in 2019, please contact us. 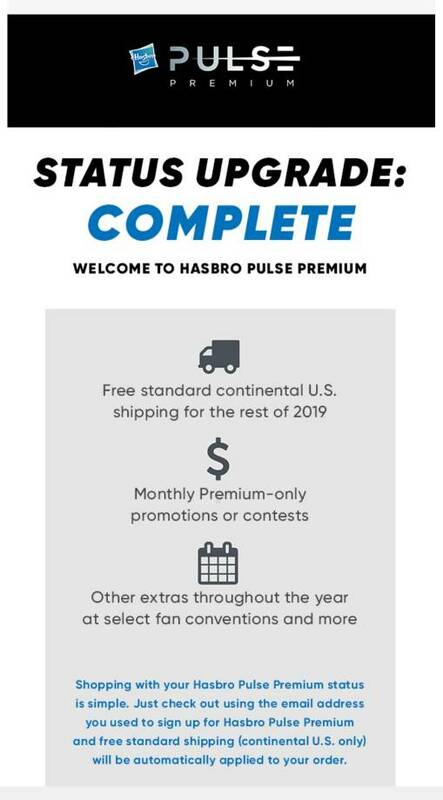 Note, that if a customer unenrolls from Hasbro Pulse Premium in 2019, they will not be eligible for free standard shipping or any other perks associated with this status throughout the year. We reserve the right to accept or refuse Hasbro Premium Pulse status upgrades in our discretion. You may not transfer or assign your Hasbro Premium Pulse status or benefits, including promotional codes, except as allowed in these terms. You are not permitted to use your Hasbro Pulse Premium status upgrade to purchase for resale, rental, or to ship to your customers or potential customers. From time to time, Hasbro Pulse may choose in its sole discretion to add, remove or change the Hasbro Pulse Premium benefits and terms. Update: got the official email about enrollment about 6 hours ago. First hint of a possible SDCC "epic perk" from Pulse?